Sick of watching the same horror movies every October? Here are some you may have missed. Back in the day, TV networks would fill their Halloween schedules with all night horrorthons. Today, a celebrity chef wearing a vampire cape on a reality show is the closest they get to throwing horror fans a bone. Thankfully we live in the internet age, and it’s easier than ever to get your hands on movies. If you fancy hosting your own Halloween horrorfest, but feel you’ve already seen all the well known classics of the horror genre, fear not, as we present 10 great horror movies that we feel are sadly overlooked. In the early '40s, producer Val Lewton was responsible for a series of horror movies that took the genre away from the schlockiness of the Universal monsters and towards a darker, more adult approach. His collaborations with director Jacques Tourneur (Cat People, I Walked With a Zombie) have historically drawn the most acclaim, but this Mark Robson directed chiller is arguably, of all Lewton’s productions, the one that holds up best today. The movie features a female student who travels to New York to investigate her older sister’s disappearance, uncovering a Satanic cult in the process. With its lesbian undercurrent and a shocking suicide scene, audiences in 1943 probably weren’t ready for a movie like The Seventh Victim, but it’s well worth rediscovering today. French director Jacques Tourneur is best remembered for his Hollywood collaborations with Val Lewton in the early '40s, but he made his finest film in England a decade later with this adaptation of the MR James short story Casting the Runes. Dana Andrews stars as an American scientist who travels to London to attend a skeptics’ convention with the aim of exposing Satanic cult leader Niall MacGinnis as a fraud. He soon finds, to his detriment, that the powers of Satan are indeed at play. The film has a great strand of black humour and was all but unofficially remade by Sam Raimi as Drag Me to Hell in 2009. Thanks to being screwed over by the film’s producers, Carnival of Souls is the only movie ever directed by Herk Harvey, a real shame, as this is an overlooked classic that influenced some of the genre’s most famous offerings. M Night Shyamalan borrowed its twist for The Sixth Sense, and Polanski’s Repulsion owes much to its central plot of a young woman driven insane by paranoia and sexual repression, while the curiously offbeat look at Americana seems straight out of the world of David Lynch. Watch out for the director’s creepy appearance as a ghostly figure who appears on a lonely stretch of road to terrorise the film’s troubled heroine. Throughout the '70s, BBC produced a series of ghost stories that would play on BBC2 each Christmas night. The best of the lot played on Christmas of 1972 in the form of The Stone Tape, penned by legendary sci-fi writer Nigel Kneale and directed by Hammer Films stalwart Peter Sasdy. A group of researchers arrive at an old Victorian mansion that is reputed to be haunted. Their aim is to explore the idea that ghosts are in fact simply recordings of traumatic past events, but they soon discover their theory is flawed and the building’s apparitions are all too real. John Carpenter drew heavily on this for his 1987 Prince of Darkness, and the recent Hammer offering The Quiet Ones also owes much to its premise. In spite of its lurid title, Don’t Look in the Basement is one of the more sophisticated horrors of the '70s. Set in a secluded sanitarium, where the lunatics have quite literally taken over the asylum, the film plays out like a dark reflection of One Flew over the Cuckoo’s Nest, with a wonderful cast of oddballs. A belated sequel arrived in 2015, and Martin Scorsese’s Shutter Island shares so many plot elements that it’s almost a remake of Brownrigg's film itself. Willard Huyck is to the '70s Movie Brats clique of filmmakers (Scorsese, Spielberg, Lucas, Coppola, De Palma etc) what Pete Best is to The Beatles. Best known as the screenwriter of American Graffiti and Indiana Jones and the Temple of Doom, Huyck’s 1973 directorial debut deserves to be mentioned alongside the finest horror movies of the decade. Set in a spooky California coastal town, whose residents have begun to act like zombies, the film plays like a cross between European arthouse and American grindhouse, with stunning compositions and a chilling atmosphere. The highlight is a terrifying Hitchcockian set-piece in a movie theatre. Like a Woody Allen of exploitation filmmaking, writer-producer-director Larry Cohen used the city of New York like few others in a series of genre outings across the '70s and '80s. God Told Me To is his masterwork, a religious themed horror thriller that’s the equal of The Exorcist in its exploration of spirituality. When New Yorkers begin committing murders, all claiming “God told me to,” an NYPD detective uncovers a startling revelation in one of horror cinema’s greatest plot twists. Watch out for a cameo by a then unknown Andy Kaufman as one of the killers. A randomly numbered slasher sequel? Not quite. The second sequel to John Carpenter’s 1978 masterpiece bears little relation to the rest of the series. There’s no Michael Myers this time around, instead the villain is Irish actor Dan O’Herlihy as the evil owner of Silver Shamrock, a Celtic company specialising in Halloween masks, with a plot to kill the children of America on Halloween night. At the time of its release the movie was lambasted by Halloween fans, angered at the omission of their beloved Myers, but the film has been re-evaluated in recent years. Now many consider it the best of the Halloween sequels. The genius behind some of the best genre films of the '70s and '80s, John Carpenter’s career has been less than stellar in recent decades. The '90s wasn’t good for his CV, but this 1994 offering is the one standout. Drawing on the work of writer HP Lovecraft, the film stars Sam Neill as an insurance investigator looking into the disappearance of the world’s best-selling novelist, a Stephen King surrogate named Sutter Cane. 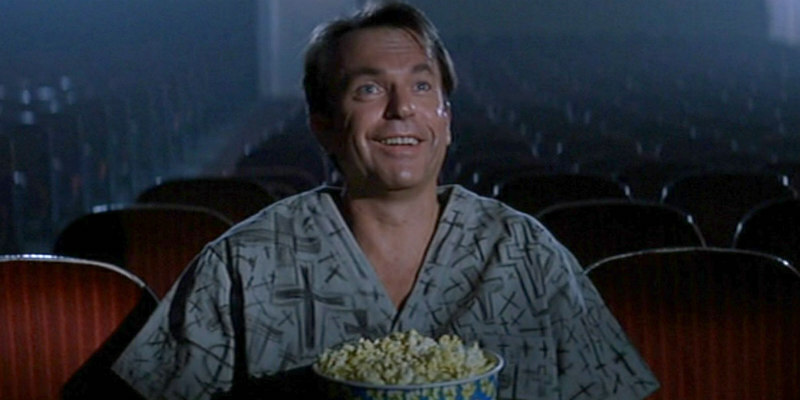 Carpenter’s movie suffered from being somewhat ahead of its time with its postmodern, meta musings, but in the post Scream horror landscape it’s due for reappraisal. There’s more to Canadian horror than David Cronenberg, as this clever low budget thriller shows. Set entirely in a radio station during what appears to be the outbreak of the zombie apocalypse, Pontypool features a cracking central performance from Canadian cinema’s hardest working performer, Stephen McHattie. The novel twist of Pontypool is that its virus isn’t transmitted through human contact, but rather through language, with certain words becoming “infected.” Based on a novel by Tony Burgess, there’s also a BBC Canada radio production that’s worth giving a listen to.